...(easy returns, low risk), which led to the eventual greed-peak in the year 2008 (Real-Estate Bubble). My personal investing-strategy (Ralph Gollner) around my core-holdings in my stocks-portfolio is to concentrate the Long-Term Strategy around those companies, which already built and are still building their Moat in order to succeed in a fast-pace-moving world (future may be enabling industrials to achieve higher productivity via adapting new technologies). In that new tech-decade, which started to take off -according to my personal view- in the years 2014 and 2015 - many "things" and many more industries are starting to be interconnected or working together via Real-Time connections (Business to Business). Enabling companies or corporations which deliver the critical tools in order to operate smoothly and even more efficient than ever before, without interference may also be the key for long-term success (delivering products and services to their clients in an easy way at affordable costs). 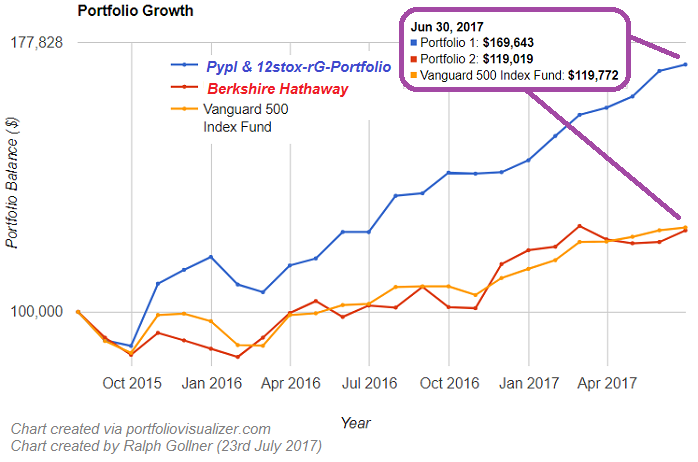 In following comparision chart I compared the performance of the "old-school-vehicle" of Warren Buffet (Berkshire Hathaway) with the S&P 500 (Vanguard INDEX Fund) and my 13-stocks-core-holdings-portfolio (see also the barchart-diagram above). Still, this is just a backtest and not a real comparison of my Real-Stocks-Portfolio (which btw is much more diversified, globaly diversified and also sector-allocation-wise more diversified across the various industries - e.g. more Health, more Industrials, etc.). Well, my strategy takes the view, that a mix of VALUE-Plays and new Technology companies (from ALL over the world), yet combined with traditional Technology-Companies may be the way how to invest in the years to come (meaning an investment-decade: 2018 - 2028). Anyway - we will only see in the future, what returns such a strategy will bring. 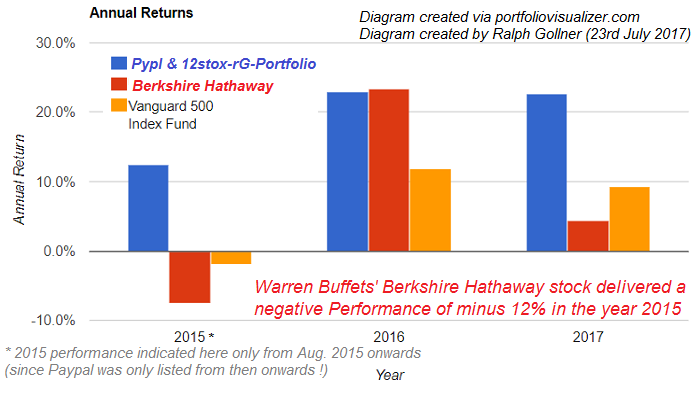 Furthermore, coming from a Risk-Management-Background I will try to avoid any downturn like the one Warren Buffet took in the year 2008 (Warren Buffet took a hit of MINUS 31% that year ! ).